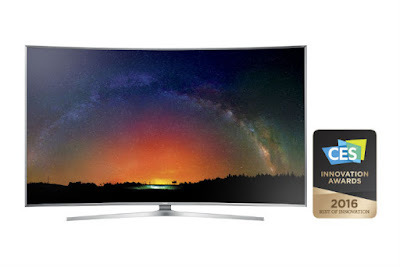 Samsung Electronics announced it has won a CES 2016 Best of Innovation Award in the Accessible Tech category for one of its new Smart TVs, which will be revealed in full at CES in Las Vegas, on January 5th, 2016. Held annually, the CES Innovation Awards honor outstanding design and engineering in consumer technology, with the winning products displayed for everyone to experience at the Innovation Awards Showcase, live at CES. Samsung’s Voice Guidance feature makes a range of TV functions easier to use, including setup, web browsing and other steps typically only shown on screen. Using their normal conversational voice, people can easily interact with the TV, for example to record upcoming programs and manage various Smart TV applications, as well as to request information such as show times and program titles. The Amplify function of Samsung Smart TV can enhance high-frequency sounds to further improve sound clarity. Another Clear Voice function makes spoken dialogue easier to hear by adjusting frequency of the voices in the TV. New Smart TV’s graphical user interface offers better overall on-screen readability with twice the contrast of previous models. Samsung’s drive to constantly develop its TV technology with advanced yet intuitive functionality and new accessibility features, helps provide an improved TV viewing experience for all consumers. Voice Guidance, Amplify and Clear Voice functions are also designed to be simple and easy for everyone to use. Finally we got our hand on the VIEWSONIC VX2363Smhl-W Monitor, to make it affordability and to balance between quality ViewSonic has combined the Image Quality, and few features, I can say this the ViewSonic VX2363Smhl is an absolute joy to use. Build quality is good, it has a white body with design for bezels. The frameless design gives the VX2363Smhl a classy and a clean look. It allows only for tilt adjustment and I cannot complain much coz at this price we cannot expect more. 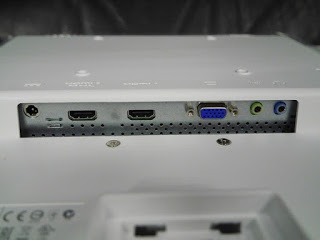 settings, it has 1.5 watt speakers at the rear with a Kensington lock slot, and connectors for power Port, 2 HDMI port (2.0MHL & 1.0), VGA port and Audio In & out port, beside all these it also includes AC/DC adaptor, power cable, VGA cable and HDMI cable and an Audio cable all these inclusions makes the setting any easy one and also added the value of the monitor. 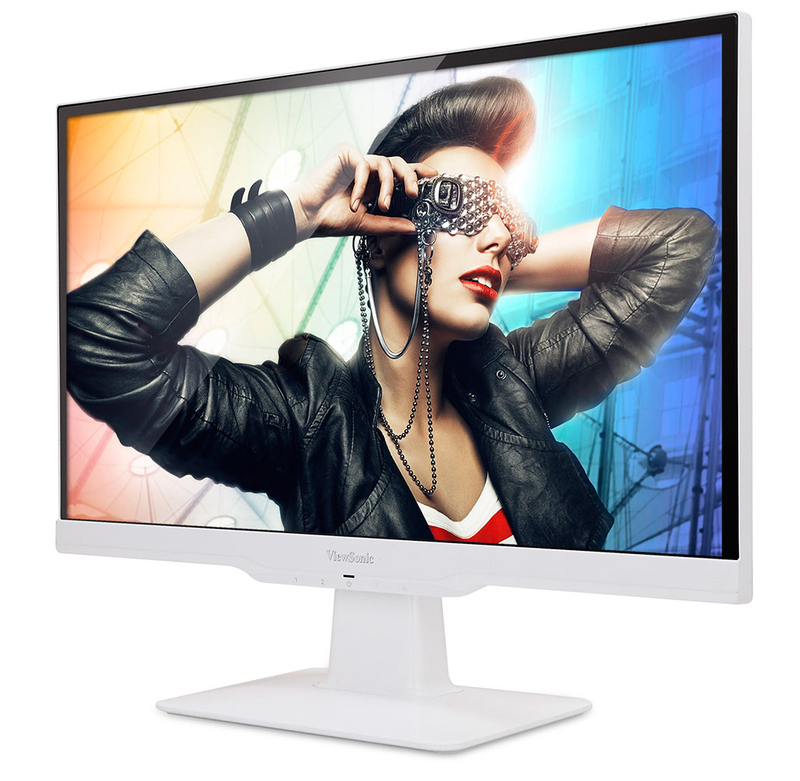 The VX2363Smhl-W uses a 1080p IPS panel, albeit a lower-speed 6-bit one, which, when combined with the monitor’s, Super Clear Image Enhancement Technology, 50M:1 MEGA Dynamic, and 2ms (GTG) response time, makes for quite the combination of color reproduction, viewing angles, contrast, and performance for gaming and its color reproduction and contrast are both expectedly impressive. Playing game on this Monitor was quite comfortable, as it uses an IPS panel which usually comes with response times as high as 12ms, (GTG). The response time is both incredibly welcome and remarkable. We were also quite happy with how smooth the output on the monitor was in spite of having a standard refresh rate of 60Hz. The built in speakers performed a lot better than I had expected. I would like to recommend to my readers if anyone needs a quite descend monitor not too heavy on the pocket, and looking for an affordable 23 inch 1080p IPS monitor. This is a superb monitor for anyone – and a bonus to those looking for a cheaper way into triple-screen gaming. PNY Technologies®, Inc. (“PNY”) is considered a leading designer, manufacturer and a worldwide leader in DRAM Memory and Flash Memory products. As every year PNY spreading the love and happiness in the holiday season, wishing its Facebook fans Merry Christmas and hoping that this year the Christmas will fill their life with lots of love, happiness and wonderful things. PNY will be giving away 5 wonderful gifts to their Facebook fans and spreading the act of sharing and kindness in the season of Christmas. Christmas is one of those holidays that just seem to be filled with cheer and wonder, so this Christmas PNY will be giveaway some wonderful prizes to its fan, to celebrate with its families and loved ones. 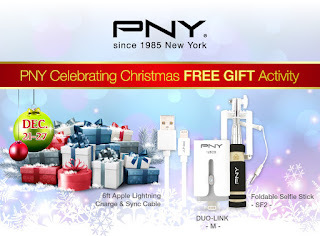 The fans just need to participate and get a chance to win the Happy Christmas Giveaway from PNY. One of the things Apple’s iPhone 6 Plus and iPhone 6S Plus are popular for are their battery life, but on the iPhone 6 and iPhone 6S, battery endurance is sadly not a bullet point on the list of pros. 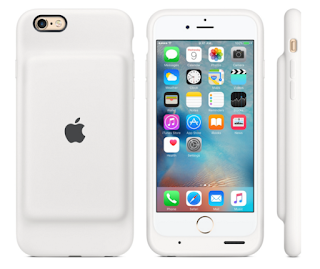 The Cupertino giant is no doubt aware that its 4.7-inch iPhones aren’t as long-lasting as their Plus counterparts, so it has made its debut in the smartphone battery pack market with an official battery case for the iPhone 6 and iPhone 6S. Apple is calling it the Smart Battery Case, and is touting an additional 18 hours of web browsing on an LTE connection, 20 hours of video playback, and up to 25 hours of talk time. The case – rated at 1,877 mAh – is charged with the company’s proprietary Lightning cable, and once connected to an iPhone, the battery level of the case and the phone itself will be visible in the phone’s notifications center. If both the battery case and iPhone are at 100 percent battery level, the former’s battery will be depleted before the phone switches to the internal battery. The Smart Battery Case will be available in charcoal and white for USD99. PNY 6ft Apple Lightning charge and sync cable, now you can charge all your iPod devices without worrying about knots and tangles with the convenient 6ft long cable. It can easily connect and charge your iPhone, iPad or iPod devices’ battery life or sync with your ITunes media library. The PNY Lightning Charge and Sync Cable is 6 ft in length (twice the length of standard OEM cables) and has two connectors, a Lightning compatible connector, and a standard USB 2.0 connector for simple syncing connectivity. Simply plug your device into any wall charger adapter, power bank or computer USB port for easy charging compatibility.Constructed with the highest quality materials, the ultra-light weight and flexible cord lets you carry this cable whenever you are on the go. It supports any standard USB port on your PC, laptop or charging adapter. The 6ft Lightning Charge and Sync Cable ensures a quick and efficient charge and provides the extra juice for your precious mobile devices. The PNY 6ft Apple Charge and Sync Cable is available in white colour cable and is backed with a warranty of 1 year from the date of purchase. Motorola has launched the Moto G Turbo Edition in India. The phone is priced at INR 14,499 and will be available through Flipkart. 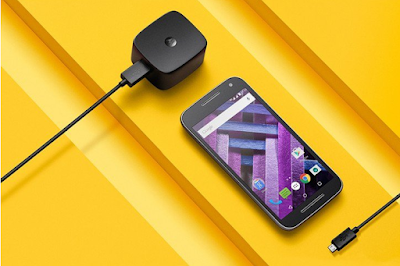 The Moto G Turbo Edition differs from the standard version in two major ways. For one, it runs on the Snapdragon 615 instead of the Snapdragon 410 on the standard Moto G. And second, it supports Qualcomm Fast Charging, or as Motorola likes to call it, Turbo Charging. The phone also comes with a Turbo Charger in the package. The rest of the specs are identical, which includes a 5.0-inch 720p display, 2GB RAM, 16GB storage, 13 megapixel camera, and 2470mAh battery. The phone is available starting today in Black with Deep Sea Blue back and White with Slate back. PNY HP v215b. The mini-sized drive comes with a vast array of functional features, which makes it a coveted item that is practical yet stylish. It is encased in polished metal casing with bright mirror furnishing revealing a smooth and durable surface that retains its stainless finish without leaving any fingerprints or scratches. Its cap less design eliminates the usual possibility of a cap getting misplaced or lost. This allows you to carry the drive anywhere you want without worrying about a misplaced cap or fear of it getting lost. The drive is perfect for storing all your work, homework assignments, and entertainment or media files at once. Simple plug-and-play operation allows you to transfer your files and offers easy navigation without any lags or system stalling immediately. 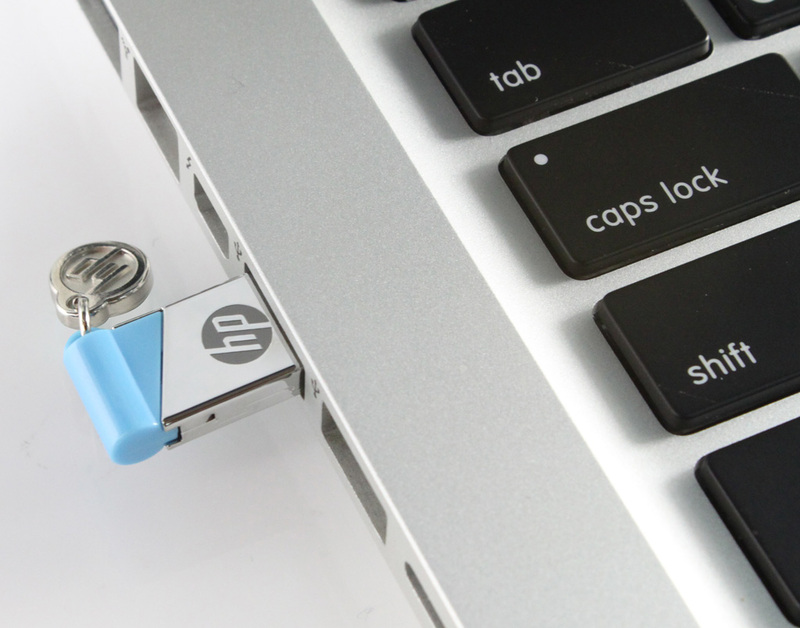 It is adorned with a unique personalised HP logo charm, which makes it a fun accessory to store all your files and data. The package of HP v215b comes with original HP logo sticker to prevent counterfeit of products; the holographic logo on the label will have a different appearance from different angles and ensure that the consumer receives genuine service and functionality of the product. Its lightweight (5.3g) and pint sized dimensions makes it extremely portable and travel-friendly no matter where you go. The storage capacities range from 8GB, 16GB and 32GB offering maximum storage for digital files, photos, music and data. The drive is compatible with Windows 2000, XP, Vista, 7, 8 and even Mac OS: 10.3 and above. The HP v215b is available for a limited warranty of 2 years. The two companies announced that together they will co-brand and co-market special Razer Edition models of Lenovo’s Y series gaming devices – marrying the manufacturing, supply chain and channel relationships of Lenovo, the world’s number one PC maker, with the immersive technology and deep expertise of Razer, a leading company in connected devices and software for gamers. PC gaming today offers a rich and immersive experience – thanks in part to cutting-edge graphics performance, superior processing power, and peripherals designed specifically for gaming. Lenovo will employ its system design and engineering expertise, while Razer will enhance the immersive experience for gamers. All forthcoming Lenovo Razer Edition products will be co-branded and reflect the edgy Lenovo Y series look and feel with iconic Razer elements like customizable Chroma lighting effects. Razer matches Lenovo’s scale and broad appeal with a high-touch dedication to the gaming community. Lenovo and Razer will be offering Y series Razer Edition products to Lenovo’s extensive global reach and Razer’s core gamer communities. Additionally, both companies are looking to jointly double down efforts to fast track the development of new technologies, including gaming experience enhancements. Get the best out of your Apple gadgets with PNY’s specially designed range of Apple accessories for your iPhone, iPad and iPod device. 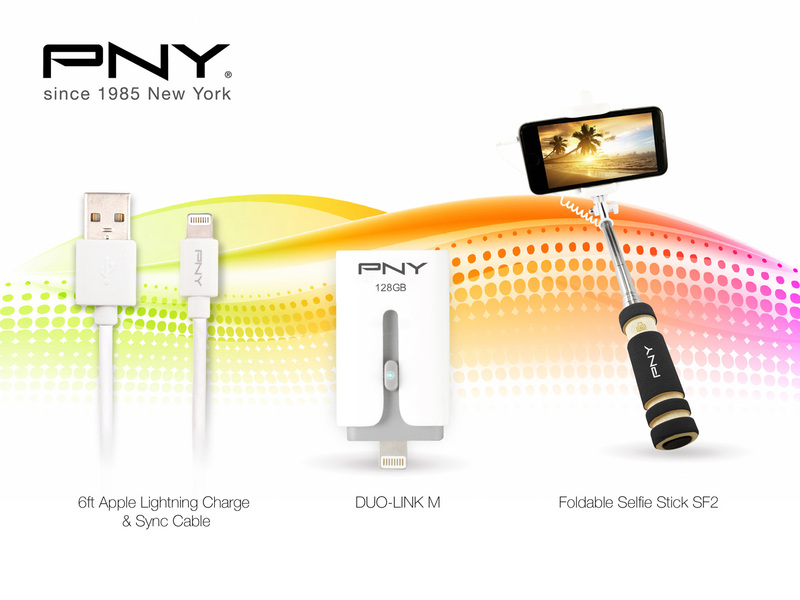 PNY Technologies, world renowned manufacturing giant for USB and Memory products, has released a selected range of gadgets dedicated to Apple products that complements and maximizes the performance of your favourite iPhone or iPad. The apple-centric products include the DUO-LINK M, Selfie stick SF2 and 6ft Apple Lightning charge cable.Running out of memory space and need more room for storing your favourite clicks and wide music collection? PNY’s DUO-LINK M is the perfect solution to store all your personal selection of music, videos and images in your lightning equipped iPhone or iPad. Expand your phone’s limited storage capacity with the DUO-LINK’s massive 128GB memory. Now you can transfer pictures and songs to your PC or MacBook without deleting them by simply plugging in the DUO-LINK M and freeing up your phone’s memory space. The DUO-LINK M is not only limited to storing and transferring files, but you can also stream movies or music to your lightning equipped iPad or iPhone without a wireless network. Light and compact, the DUO-LINK M is an extremely convenient digital storehouse that features a standard USB interface and a lightning connector. PNY has released the DUO-LINK App for users to download and use the device at its full potential. The user manual can be downloaded from the App store and your device is ready to be used. iPhones have one of the best cameras for capturing selfies and snapshots of your favourite moments. 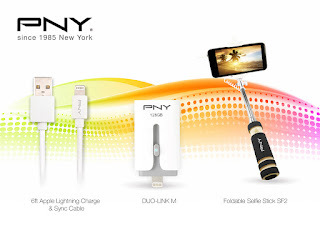 You can enhance the fun and creative part of it with PNY’s Selfie Stick SF2. This Aux-wired monopod extends from 13.5 cm to 60 cm, so you can capture wider shots for group selfies or to shoot landmarks. The SF2 is a retractable stick with 7-flex section which can be easily folded and carried around when travelling. The sturdy mobile clip can load up to 500g weight and can rotate at 270 degree, which enables you to shoot at every possible angle. The SF2 features a handy skid-proof remote holder with keystroke that controls the mobile camera with a simple click. It operates smoothly with Android 4.3 above or all Apple IOS 5.01 above smartphones. Clicking selfies or transferring files from your phone can seriously drain your iPhone’s battery life. Keep them fully charged with PNY’s 6ft Apple Lightning charge cable. The 6ft cable allows you to easily connect to your Apple iPhone, iPad or iPod to charge the battery or sync with your media library. Normal charge cables limit your phone’s charging capacity due to its short cord length, but PNY’s 6ft cable prevents this problem by allowing you to reach your wall charger or the USB port located on the front/back of most computers. No more tangles or messy cables thanks to its flexible cord and ultra-light weight size. The 6ft lightning charge cable works with iPhones, iPads and iPods. All the above listed products can be purchased in selected PNY stores across the world. For further information, visit the official PNY website for product details and prices. 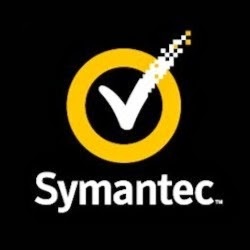 Symantec Corp., one of the leaders in cybersecurity, today announced plans to beef up its Cyber Security Services business globally with an investment of more than US$50 million. A portion of this investment has been leveraged to build a new dedicated Security Operations Center (SOC) in Singapore, inaugurated today, doubling Symantec’s Cyber Security Service expertise in the Asia-Pacific region. Now more than ever, organizations require a deeper security understanding and strong proactive security measures to gain the upper hand on adversaries. Symantec’s SOCs analyze 30 billion logs worldwide each day to provide enterprise-wide protection to help organizations strengthen their defenses and respond to new threats as they emerge 24 hours a day, 7 days a week, 365 days a year. With the launch of the SOC in Singapore, businesses will have access to intelligence, accurate threat detection and proactive notification of emerging threats to ensure their most sensitive data is protected. The new SOC will also enable businesses to shorten the time between detection and response, reduce operational costs and proactively counter emerging threats. “Today, technology alone may not stop advanced threats. Organizations need security experts on hand to interpret and prioritize the critical events that need action. By investing in people and security IQ in Singapore and the Asia-Pacific, Symantec is expanding its visibility into the region, enabling us to bolster customers’ security operations capabilities, and protect their critical information and assets,” said Samir Kapuria, SVP and general manager of Cyber Security Services at Symantec. “The Asia-Pacific region is incredibly diverse and multi-cultural. This allows us to attract highly educated multi lingual security professionals who bring expertise and experience from many vertical industries and global security organizations and are well-versed in the security landscape,” added Kapuria. Last year Symantec’s team of cyber professionals protected organizations from more than half a million web attacks per day, according to the 2015 Internet Security Threat Report. The investment will enable the company to expand its Chennai, India SOC as well as the Tokyo, Japan SOC. The next phase of the company’s SOC expansion will take place in Europe, with more facilities expected to open within the next 12 months. Once complete, Symantec will have eight SOCs worldwide, extending their current team of 500+ certified cybersecurity professionals to address every stage of the cyber-attack lifecycle. Symantec has also invested significantly in its cyber services-enabling technology, including big data analytics and distributed computing. With an increasing demand to manage customers’ security environments with Security as a Service, Symantec Cyber Security Services offers a strong portfolio, including Managed Security Services, DeepSight Intelligence, Incident Response and Security Simulation training. This announcement follows a US$20 million investment in existing SOCs across Australia, India and Japan in the past year.